We made our way from D.C. to San Francisco a few weeks ago to host our latest TALK at Zendesk‘s cutting-edge HQ. We knew it was going to be cool — the 75,000 square foot office has been featured extensively on our site and in other publications — but in person, it exceeded expectations, and so did the panelists. While each one is a workplace expert independently of one another and of this project, and thus was able to speak about the TALK topic generally, each also had a hand in creating this Zendesk space, so the audience was privy to specific, grounded, and actionable examples of how choice in the workplace works out IRL. The lineup: Donnette Clarens, a senior managing director at Newmark Cornish & Carey (and Zendesk’s broker); Tamar Draper, the director of global workplace experience for Zendesk; Melissa Hanley, principal and CEO at Design Blitz (the design team behind the project); and Ains Hill, the senior manager of workplace operations for AppDynamics (and, formerly, the global head of operations for Zendesk). Bob Fox, our publisher, moderated. It became quickly apparent in the course of conversation that Zendesk was an ideal host for this TALK topic: the office itself is a case study in choice at every scale. 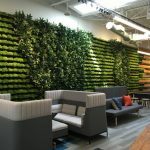 There’s an incredible amount of flexibility for employees within the building, but they’re encouraged to take advantage of amenities outside of the building, too. On top of that, the company has managed to establish what appears to be a true and uplifting connection with their neighbors in the Tenderloin, opening the space for after school tutoring and other events that benefit the community. The panelists, from L to R: Melissa Hanley, Ains Hill, Tamar Draper, and Donnette Clarens. Photo by Jeff Rumans. In addition to the host of amenities that an urban campus provides, the employees have an array of options inside of the office, as well. “We didn’t know at first who would be moving in, so we designed the space to be as flexible as possible,” said Hill. With employees spread over the building’s six floors, initially they were concerned about isolating different teams. 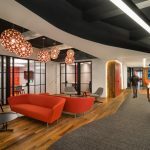 To keep that from happening, they built a variety of spaces like coffee bars, a yoga room, snack stations, and collaborative areas that draw staff between floors. When thinking about the competing desires for collaborative space and focus space, Hanley said that they practiced “city planning 101, but for the workplace”: “We gave them a sense of protected space, but where they could have their ‘eyes on the street’,” she said. “We don’t really have policies [on how to use the space],” said Draper. “We learn from intuitive use. We might design it differently then in the next building,” adding that there’s been a “bleeding” of the way they’ve approached this specific office in other cities where they set up shop. When they set out to design new offices, Draper said that they host “design summits” with local employees to find out how they work, and then decide how the design of the new spaces can best support it. “We ask them, When you walk in in the morning, what is your day like? How do you work? How do you want to work? What do you see at 1019 that you want in your own space?,” she said. To learn more about the Zendesk project, check out our project profile here.